Our Analytical Instrumentation Tests allow you to experience an online examination in the real-time environment. In every online test on Analytical Instrumentation, you will be presented with Multiple Choice Questions (MCQs) which will test your skills in Analytical Instrumentation Concepts in a detailed and comprehensive manner. In the test, each question will have 4 options to choose from. You should select only 1 correct option as an answer and then move on to the next question. Once you submit answers to all the questions, you will be given your final test score. In the Online Analytical Instrumentation Test, for every correct answer, you will be given 2 points. There will also be negative marking of -1 for every wrong answer. So, you will have to be more careful in choosing the answers to the question in your online examination. If needed, you should skip to the next question and come back to the previous question later so that you can do proper time management for the online mock tests. 1. "Analytical Instrumentation Practice Tests" - In Analytical Instrumentation practice tests, there will be a series of practice tests wherein you can test your Analytical Instrumentation concepts on every chapter separately. There will not be any time limit on these tests. So, Analytical Instrumentation Practice Tests should be the first set of tests which you should attempt. Goto these practice tests here. 2. 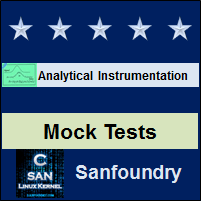 "Analytical Instrumentation Mock Tests" - In Analytical Instrumentation mock tests, there will be a series of mock tests wherein you can test your Analytical Instrumentation concepts on every chapter separately, but there will be a fixed time limit per test. So, it is similar to Analytical Instrumentation Practice Tests, but with an added constraint of time limits. You should try Analytical Instrumentation Mock Tests if you are appearing for any online examination soon. Goto these mock tests here. 3. "Analytical Instrumentation Certification Test" - Once you are through with your Analytical Instrumentation concepts, then you should try our Analytical Instrumentation Certification Test wherein Sanfoundry will issue a free Certificate to you if you scored either Grade A* or Grade A in Analytical Instrumentation Certification Test. Goto Analytical Instrumentation Certification test here. 4. 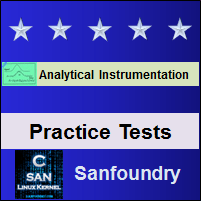 "Analytical Instrumentation Internship Test" - If you are interested to do Internships in Analytical Instrumentation at Sanfoundry, then you must take our Analytical Instrumentation Internship Test. 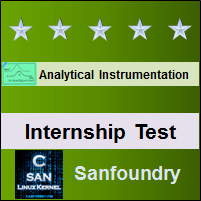 If you scored either Grade A* or Grade A in Analytical Instrumentation Internship Test, then you are eligible for Internship at Sanfoundry in Analytical Instrumentation. Goto Analytical Instrumentation Internship test here. 5. "Analytical Instrumentation Job Test" - If you are a fresher, a dropout, an experienced person and if you know Analytical Instrumentation well and looking out for jobs in Analytical Instrumentation domain at Sanfoundry (or our Network of Companies), then you should try and qualify our "Analytical Instrumentation Job Test". 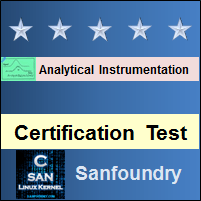 If you scored either Grade A* or Grade A in Analytical Instrumentation Job Test, then you are eligible for a Job at Sanfoundry (or our Network) in Analytical Instrumentation domain. Goto Analytical Instrumentation Job test here. For every "Analytical Instrumentation Practice Test", Total Questions: 20, Total Time: Unlimited. For every "Analytical Instrumentation Mock Test", Total Questions: 20, Total Time: 20 Minutes. For "Analytical Instrumentation Certification Test", Total Questions: 50, Total Time: 1 hour. For "Analytical Instrumentation Internship Test", Total Questions: 50, Total Time: 1 hour. For "Analytical Instrumentation Job Test", Total Questions: 50, Total Time: 1 hour. Before you get started on these series of online tests on Analytical Instrumentation, you should learn, study and practice our collection of 1000 MCQs (Multiple Choice Questions and Answers) on Analytical Instrumentation here. We also prefer that you should practice Analytical Instrumentation practice tests and mock tests completely before attempting the certification test. Here is the list of online practice tests and mock tests on Analytical Instrumentation. Each online test focuses on a "Specific chapter of Analytical Instrumentation". So, you should try both practice test and mock test on every chapter to do a self-assessment of your knowledge (along with time-limit constraints) in every area or sub-topic of Analytical Instrumentation. Analytical Instrumentation Certification test, Internship test, and Job Test are mentioned at the end of this list. 1. Analytical Instrumentation Test 1 – This set of online test on “Analytical Instrumentation” tests your skills on Spectral Method of Analysis, Introduction to UV Visible Spectrometers, Absorption Instrumentation and Block Diagram Representation, Single Beam and Double Beam Instruments, Instrumentation of IR, Fourier Transform Infra-red Spectrometers, Atomic Absorption Spectroscopy, Flame Emission Photometers. 2. Analytical Instrumentation Test 2 – This set of online test on “Analytical Instrumentation” tests your skills on Introduction to Chromatography, Operation of Chromatography, Chromatographic Behaviour of Solutes, Column Efficiency and Column Resolution, Gas Chromatography, Detection System of Gas Chromatography, Gas Solid Chromatography, Liquid Chromatography, High Pressure Liquid Chromatography. 3. Analytical Instrumentation Test 3 – This set of online test on “Analytical Instrumentation” tests your skills on Detection System of Liquid Chromatography, Amino-Acid Analysers, Paramagnetic Oxygen Analyser, Magnetic Wind Instruments, Electrochemical Methods for Oxygen Analysis, NO2 Analyser, H2S Analysers, Infrared Gas Analysers. 4. Analytical Instrumentation Test 4 – This set of online test on “Analytical Instrumentation” tests your skills on Thermal Conductivity Analysers, Analysers Based on Gas Density, Method Based on Ionization of Gases, Sulphur Di-oxide Monitoring, Estimation of Nitrogen Oxides, Estimation of Carbon Monoxide, Estimation of Hydrocarbons, pH Measurement and Types, Hydrogen and Glass Electrodes. 5. Analytical Instrumentation Test 5 – This set of online test on “Analytical Instrumentation” tests your skills on Secondary Reference Electrodes, Combination Electrode, pH Meters, Ion Selective Electrodes-Principle and Types, Ammonia and Fluoride Electrode, Special Designs of Ion Selective Electrodes, Ion Analyser, Biosensors, Dissolved Oxygen Analyser. 6. Analytical Instrumentation Test 6 – This set of online test on “Analytical Instrumentation” tests your skills on Sodium Analyser, Silica Analyser, Fundamentals of Radiochemical Methods, Radiation Detectors, Gamma Camera, Liquid Scintillation Counters, Pulse Height Analyser, Instrumentation of X-Ray Spectroscopy, X-Ray Diffractometers. 7. Analytical Instrumentation Test 7 – This set of online test on “Analytical Instrumentation” tests your skills on X-Ray Absorption Meter, X-Ray Fluorescence Spectrometry – Introduction, X-Ray Fluorescent Spectrometer, Total Reflection X-Ray Fluorescence Spectrometer, Electron Probe Microanalyser, Principle of Nuclear Magnetic Resonance Spectrometer, Types of NMR Spectrometers, Continuous Wave NMR Spectroscopy. 8. Analytical Instrumentation Test 8 – This set of online test on “Analytical Instrumentation” tests your skills on Fourier Transform NMR Spectroscopy, Sensivity Enhancement for NMR Spectroscopy, Principle of operation of Mass Spectrometer, Components of Mass Spectrometer, Magnetic Deflection Mass Spectrometer, Time of Flight Mass Spectrometer, Radiofrequency Mass Spectrometer, Quadrupole Mass Spectrometer, Ion Transducers. 9. Analytical Instrumentation Test 9 – This set of online test on “Analytical Instrumentation” tests your skills on Inductively Coupled Plasma Mass Spectrometer, Gas Chromatograph- Mass Spectrometer, Liquid Chromatograph – Mass Spectrometer, Tandem Mass Spectroscopy, Surface Spectroscopic Techniques, Electron Spectroscopy for Chemical Analysis, Auger Electron Spectroscopy. 10. Analytical Instrumentation Test 10 – This set of online test on “Analytical Instrumentation” tests your skills on Instrumentation for Electron Spectroscopy, Ion Spectroscopy, Instrumentation of Ion Spectroscopy, Electron Spin Resonance, Basic ESR Spectrometer, Instrumentation of ESR Spectrometer, Digital Circuits, Logic Families. 11. Analytical Instrumentation Certification Test - This set of online free certification test on "Analytical Instrumentation" tests your skills on all areas (all chapters, topics and subtopics) of Analytical Instrumentation. 12. 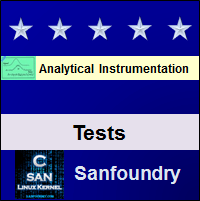 Analytical Instrumentation Internship Test - If you scored either Grade A* or Grade A in our Analytical Instrumentation Internship Test, then you can apply for Internship at Sanfoundry in Analytical Instrumentation. 13. 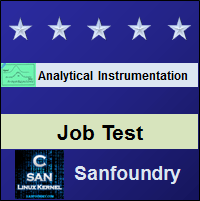 Analytical Instrumentation Job Test - If you scored either Grade A* or Grade A in our Analytical Instrumentation Job Test, then you can apply for Jobs at Sanfoundry in Analytical Instrumentation domain. Best Wishes for your Analytical Instrumentation Tests!